It's good to hear some new music from Beirut, sounding on good form on this cover of the Tropicália legend Caetano Veloso. 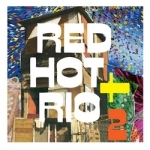 The first track from the Red Hot Organization’s sequel to their 1996 comp Red Hot + Rio, paying homage to Brazilian Tropicália. The album will also feature Dirty Projectors, of Montreal, St. Vincent, Neon Indian, Beck, Devendra Banhart, Madlib, José González, and John Legend. Quite the eclectic mix, Can't wait!